Wet and windy weather predicted for the weekend will hamper efforts to restore electricity to the whole country – but won’t stop work. Around 105,000 homes and businesses are still without power and ESB Network’s head of consumer services Senan Colleran has warned it could be next week before full service is back. Met Eireann have activated a yellow weather warning for the next few days due to the potential for wind gusts of up to 110km/h, especially in coastal counties. The National Emergency Coordination Group today reviewed the impact of the unsettled weather but concluded it will not be anything exceptional. “We don’t have any serious concerns,” NECG chairman Sean Hogan said. In their latest update the Group confirmed that 105,000 homes and business are still without power, down from 385,000 at the height of the storm. However, the rate of repair is likely to slow as technicians move to more rural areas and Mr Colleran said there is “a huge task ahead”. “The big gains have been made in the last few days but we’re now on a bigger slog,” he said. 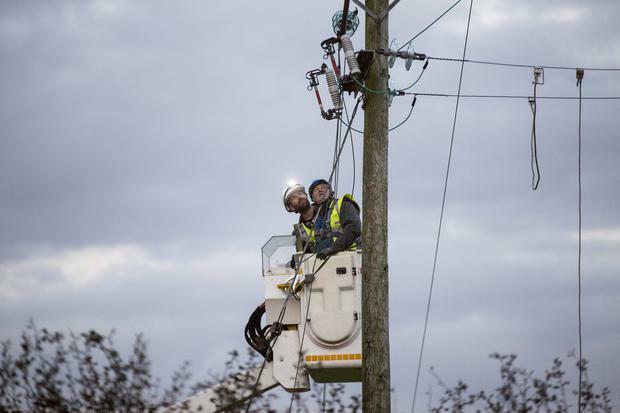 More than 250 experts are arriving in the country from Northern Ireland, Britain and France to help the 2,500 ESB workers and 1,000 contractors already on the ground. Power has been restored to all hospitals but people have been urged to check on neighbours who are elderly or infirm. He urged people, particularly farmers, not to remove fallen trees if there is any potential there could be damaged electrical wires in the area. Irish Water has also reported “excellent progress” in restoring supply to large parts of the country hit by Hurricane Ophelia. At its peak there were 109,000 premises without water, but this figure has dropped to 25,000. Another 20,000 homes remain at risk of losing water. A number of boil notices have been issued, particularly in Tipperary. Around 50 waste water plants are not operating at full capacity. The counties worst affected are Cork, Waterford and Wexford. Meanwhile, eir estimates that the number of customers without broadband, telephone and mobile service as a result of the storm has reduced to 60,000. "There are over 1,000 different locations across the country where we have sustained network damage. The scale of the damage ranges from a single pole, up to 18 poles and two kilometres of cables along one section of road," the company said in a statement. "We expect the number of customers without service will continue to reduce as power supply issues are resolved. However, the number of individual line faults reported to us will rise over the coming days."